Leading Manufacturer of Profile Controller with Data Logging, Flow Rate Meter, Multichannel Temperature Controller, Profile Controller and Production Monitor from Mumbai. 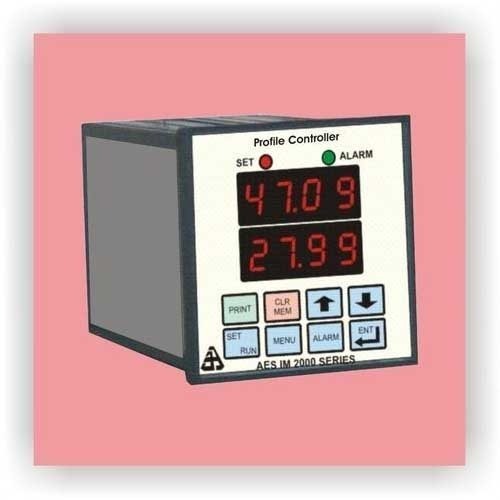 Ajinkya Electronic Systems also manufactures profile controller data logging which is process controller for controlling process parameter against time. User can define the profile he wants with the help of extensive instruction set. Unit supports instructions like jump, loop, loop with count apart from ramp soak control. Relay On and Off instruction are supported. Ajinkya Electronic Systems are manufacturer, Exporter, Supplier of Controllers. Our IM 1900 Series Indicators are micro controller based, digital and highly versatile indicator series. Flow rate meters or totalisers are for measuring flow of liquid or gas. We manufacture wide range of universal input / dedicated input Multi Channel Temperature Controllers that serve the diverse requirements of various industries. These controllers receive inputs from different sensors and the type of sensor is field selected. Controllers are available as On / Off type, Proportional and PI type. Available upto 16 inputs in universal type multiple channel controllers also have 48 channels for dedicated type in single package. Ajinkya Electronic Systems Profile Controller is Process Controller for controlling process parameter against time. User can define the profile he wants with the help of extensive instruction set. Unit supports instructions like jump, loop, loop with count apart from ramp and soak control. Auxiliary relays are provided which can be used to operate external controls like valve or hooter etc. Another application for event loggers is for Production Monitoring. It is an effective tool in the hands of management. Management can observe when a particular machine was switched on, when it was idle, when there was no power. Information about run time, idle time etc can be derived from the logs in the event logger.